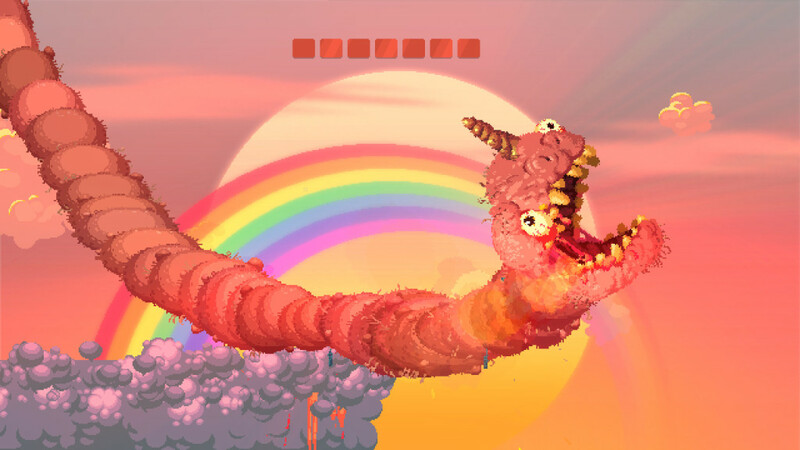 Blood, gore, fencing, archery, knife throwing and swordplay are probably the best way to describe the following game, but intense, suspenseful, hilarious and skills are another batch of important keywords when it comes to Nidhogg 2. We were unsure what to expect from this one-trick pony, but before we knew it, we were sitting on the edge of our seats, trying to mercilessly butcher our opponent, be it AI, local or online. There is absolutely no story to be found in Nidhogg 2, safe for the fact you always see two brawling figures, who repeatedly kill each other in order to reach the other end of the arena they’re in. The victor is eaten by the Nidhogg, which is a giant gnarly looking worm, and for some reason this is something all warriors hope to achieve. Then again, a game such as this doesn’t need a story to be grand, and in many ways there simply wasn’t room for an actual plot in this one. 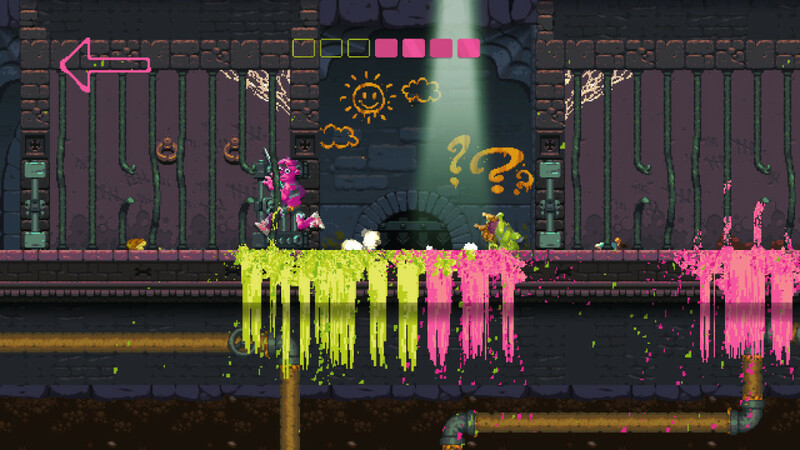 Graphically Nidhogg 2 utilizes a pixilated 8/16 bit style, which is simply exquisite. You’ll be treated to funny looking characters, which allow for a bit of customization at the beginning of your gaming session, all in a variety of neatly finished arenas, where both sides of said fighting pit are mirrored. The environments come with a hefty amount of details, which get enriched with the colored blood of the many deaths that will ensue during your gritty deathmatches. The backgrounds are done in an amusing way as well, always strengthening the already good-looking foreground. While everything looks superb in this game, it’s also clear the game hasn’t been properly optimized, as even our somewhat heavier gaming rig experienced a lot of frame drops when the background animations got a bit hectic. Nonetheless, you can mess around a bit with the graphical settings in the options menu, but sadly these options can only be reached in the main menu, thus forcing you to quit your game if problems arise. Safe for a few abysmal grunts and screams when you’re getting chopped to bits, or do the same to your opponent, it’s all about the music in Nidhogg 2. The tunes are extremely upbeat, intense, and they help get you in the mood, in and out the arenas. Each of the areas has its own track, which creates enough diversity to keep the game fresh and interesting in terms of music. In combination with the blood splatter sounds, the screams, and the clashing of swords and other weapons, this gory party is perfect. 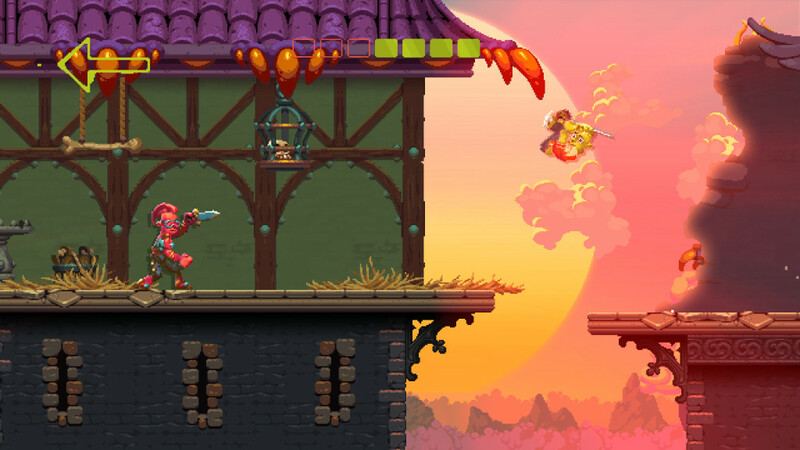 Nidhogg 2 is a multiplayer ‘fencing’ game, that is pretty much an all-out brawler in which you mercilessly slaughter your opponent, in order to reach the enemy’s side of the arena, which will reward you by getting eaten by the Nidhogg. The latter apparently is the goal of any fighter in this wacky violence filled world. That being said, you’ll constantly be chopping your opponent to bits, at least if you don’t crack his skull with your feet first. The mechanics are extremely simple as the game only utilizes two buttons on your controller, one being to swing/throw/shoot your weapon, the other to jump. The left stick will allow you to move back and forth, but flicking it up and down will switch the position of your weapons, to either strike low, in the middle, high or throw it away. Easy peasy lemon squeezy is what you might think, but the game becomes rather tricky in terms of having the proper reflexes, anticipating your opponent’s moves and of course, when you kill him, where he will spawn next and if you can make it past him. 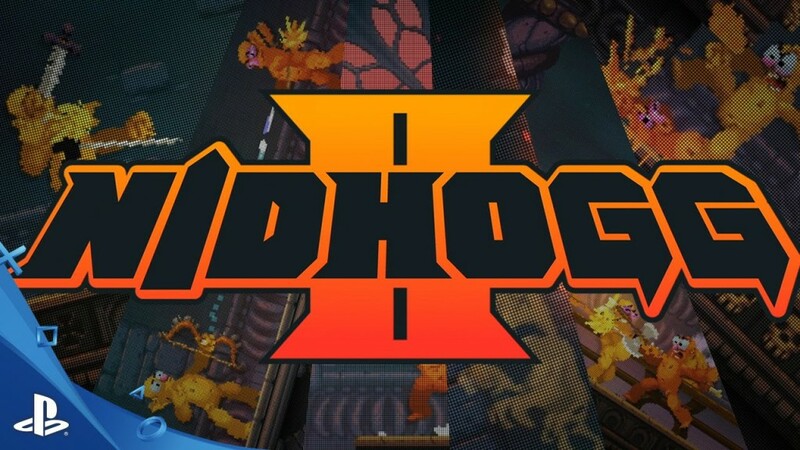 Even though Nidhogg 2 comes with a single player experience in the form of the Arcade mode, it serves best as a tutorial, seeing the opponents aren’t that smart, and the game eases you in by letting you get to know the four weapons that are available in this title. You’ll have the chance to wield a dagger, a rapier, a broadsword and a bow. If you happen to lose any of those weapons after getting them knocked out of your hands, or you throwing it at your opponent to hopefully bring home a kill, you can still rely on your feet and hands to do some damage. That being said, the meat of the game is found in the multiplayer mode, as it’s far more intense, and a lot harder to predict your opponent’s moves, as everyone moves and thinks differently. The controls in this game are extremely responsive, making it rather amusing to clash against one another, especially when both players almost have the same thought pattern. It makes sure the battles are exciting, and it makes a victory feel so much better when you win a clash. The only thing we noticed is that when you fall down a small ledge, the jump command doesn’t register too smoothly when you wish to dodge or jump over an enemy. 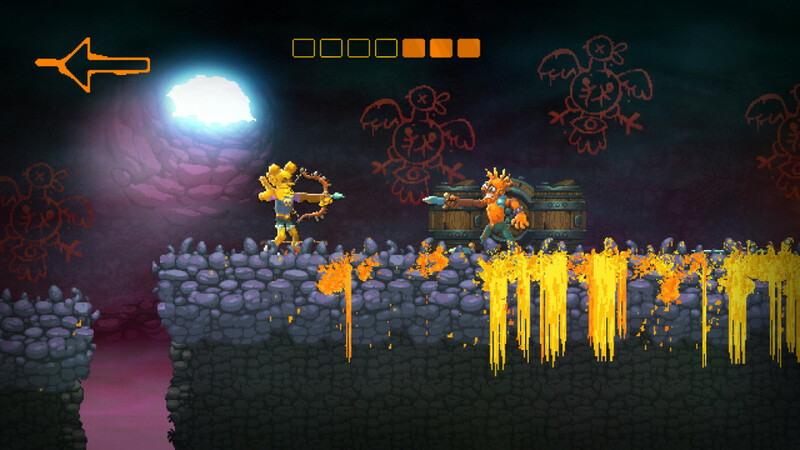 Nidhogg 2 is a great and intense experience, mostly aimed at gamers who are looking for a multiplayer voyage into a colorful, gory pixilated arena of death. While the Arcade mode stands decent on its own as a tutorial, you’ll find the bulk of joy and amusing gameplay in both the local and online multiplayer modes. Nidhogg 2 is not only extremely simple in terms of gameplay, it looks great, it plays great and above all it remains fun, even after endless matches. While the gameplay may be easy to learn, mastering your moves and training your reflexes may prove to be trickier than one might expect. Sekiro: Shadows Die Twice – new trailer released!